The India beings the Rio Paralympics Medal count from Mariyappan Thangavelu wins Gold Today on Saturday. He made a historical record in this morning on September 10, 2015. He wins Gold in Men’s high jump T-42 event at the Rio Paralympics. Also, India wins another medal in the same event by Varun Singh Bhati’s bronze. Today’s Morning Rio Paralympics high Jump concluded with the result of two medals for India. 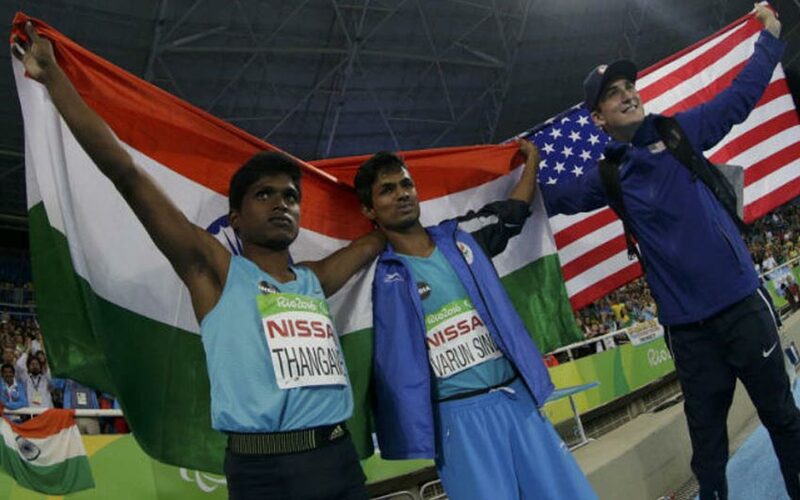 The India’s Tamil Nadu man, Thangavelu made a leap of 1.89 metres and another Indian player, Varun Singh Bhat showed his leap as best one of 1.86 metres. He is the third man of the competition. So, it is Bronze for India. The Second place goes to the US player, Sam Grewe. Totally, there is a ten attempt for each player. Maraiyappan Thangavelu completed this highest ever jump at his last attempt. In the tenth attempt, the game records had the four players in the same results as 1.77m. But, the contest needs to reduce the person to select only one from that. India’s another competitor already there with 1.83m, he is Bhat. Here, Maraiyappan joined with his to become as a top and grabbed the gold and bronze. Mariyappan Thangavelu wins Gold and Bhat wins Bronze for India. Tamil Nadu Chief Minister J Jayalalithaa announced an award of Rs 2 crore for Mariyappan Thangavelu. From the Sports Ministry, Mariyappan will get Rs 75 lakh and Bhati will be presented Rs 30 lakh for their Paralympics. WORLDHAB team congratulate both of this Indians.